Looking for outdoor accent lights to make your garden, lawn, or driveway an outstanding affair? Then these crackle glass solar lights certainly won’t disappoint. A stunning light show, mesmerizing spin, and enchanting rustic charm combine to create the most eye-catching LED crackle ball lights in the market! Fully powered by the sun, the accent lights automatically turn on at dusk to splash your yard with 7 cycling colors and mesmerize you with the rotating crackle ball that’s crowned by a copper decorative top. And you get all this spectacle without having to deal with a single power bill! No cheap plastic here. These crackle ball solar lights are made using real iron stakes that are resistant to rust and real extra-heavy glass. And we’ve complemented the heavy duty construction with a 100% weatherproof body. So whether it’s the height of summer or thick of winter, the outdoor lights keep working all through without any need for intervention. Invest in LED accent lights that aren’t just pretty, but pretty impressively durable as well! - Fitted with a high-quality solar panel that works in low-light conditions. - 300mAh NiMH battery powers up to 6 hours of lighting and spinning. - Extra-tall stakes make the light show more pronounced. - Made to the highest quality standards to achieve CE and ROHS compliance. - Come in a pack of 3 at the best price on Amazon. Make your outdoor space an enchanting escape with the most eye-catching spinning crackle ball lights. Click ‘Add to Cart’ now! - MESMERIZING LIGHT AND SPIN SHOW: Make your front lawn or garden a visual feast with our all-new solar outdoor accent lights. Not only do they come with vibrant LEDs that cycle through 7 eye-catching colors but the whole crackle glass ball also rotates to complete the spectacle. Get yourself the most stunning LED yard decorations in the market. - FULLY SOLAR POWERED: Never have to deal with utility bills or the hassle of constantly changing batteries. These solar powered color changing crackle lights are completely fueled by the sun and are fitted with a high-performance 300mAh NiMH battery that powers the spinning and lighting action for up to 6 hours on a 6-hour charge. 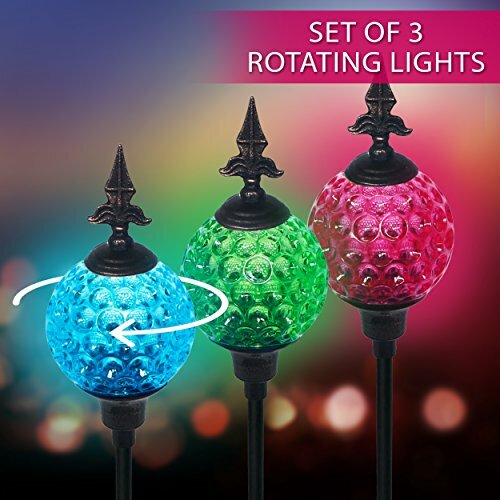 - MOST DURABLE DECORATIVE GARDEN ACCENTS: Unlike other LED accent decorative lights that are made using cheap plastic, ours feature a rust-proof iron stake and an extra-heavy crackle ball made of real glass. The weatherproof body withstands rain, shine and snow to work perfectly through all the seasons. - INSTALLS IN MINUTES: There is no need for an electrician or running extension power cables. The rotating and color changing solar lights are completely wireless, just require you to drive them into the ground, and automatically turn on at dusk and off at dawn. - BEST VALUE ON AMAZON: You'll get the greatest bang for your buck with these outdoor garden landscape lights that come in a pack of three. The solar stake lamps are CE and ROHS certified for complying with the highest production standards, with the LED bulbs rated at a whopping 100,000 hours. Click 'Add to Cart' now! If you have any questions about this product by Solario, contact us by completing and submitting the form below. If you are looking for a specif part number, please include it with your message.